The Fourth Sunday of Advent is on December 23. Readings for Year C in the three-year Lectionary follow. I am not sure how these are meant to be read, e.g. if Micah goes with the first reading from Luke and if the following three go together, so will just reproduce them as they are on the Vanderbilt Divinity Library. Emphases mine below. The Old Testament readings prophesy Jesus. The reading from Hebrews describes Jesus as the one, perfect and sufficient sacrifice for our sins. The readings from Luke — Mary’s words — are known traditionally as the Magnificat, which used to be sung in the old Anglican (including Episcopal) liturgies. The longer version is at the end. Mary visited her cousin Elizabeth, who was expecting John the Baptist at the time. 5:2 But you, O Bethlehem of Ephrathah, who are one of the little clans of Judah, from you shall come forth for me one who is to rule in Israel, whose origin is from of old, from ancient days. 5:3 Therefore he shall give them up until the time when she who is in labor has brought forth; then the rest of his kindred shall return to the people of Israel. 80:2 before Ephraim and Benjamin and Manasseh. Stir up your might, and come to save us! 80:4 O LORD God of hosts, how long will you be angry with your people’s prayers? 80:5 You have fed them with the bread of tears, and given them tears to drink in full measure. 80:6 You make us the scorn of our neighbors; our enemies laugh among themselves. 80:7 Restore us, O God of hosts; let your face shine, that we may be saved. 10:6 in burnt offerings and sin offerings you have taken no pleasure. 10:9 then he added, “See, I have come to do your will.” He abolishes the first in order to establish the second. 10:10 And it is by God’s will that we have been sanctified through the offering of the body of Jesus Christ once for all. 1:42 and exclaimed with a loud cry, “Blessed are you among women, and blessed is the fruit of your womb. I cannot imagine the jubilation that these two women shared at the fulfilment of the Lord’s promise not only to His chosen — but to the world. The feast of the Visitation of Mary to Elizabeth is on May 31 this year. Lectionary readings for Year B follow. Emphases mine below. The Old Testament reading is about Hannah, who longed for a child. One day, she went to the temple and prayed tearfully. Eli the High Priest heard her and blessed her. Hannah gave birth to Samuel and promised the Lord that he would serve Him. Mary’s Magnificat — see the Gospel reading below — echoes what is known as Hannah’s song of thanksgiving. 2:1 Hannah prayed and said, “My heart exults in the LORD; my strength is exalted in my God. My mouth derides my enemies, because I rejoice in my victory. 2:2 “There is no Holy One like the LORD, no one besides you; there is no Rock like our God. 2:8 He raises up the poor from the dust; he lifts the needy from the ash heap, to make them sit with princes and inherit a seat of honor. For the pillars of the earth are the Lord’s, and on them he has set the world. 2:9 “He will guard the feet of his faithful ones, but the wicked shall be cut off in darkness; for not by might does one prevail. I cannot imagine what that moment must have been like for Mary and Elizabeth: two expectant mothers and two holy women. The Holy Spirit entered Elizabeth, enabling her to understand that Mary would give birth to the Messiah, Christ Jesus. Then Mary spoke, spontaneously echoing Scripture and those who lived before her so long ago. In closing, the Sunday Lectionary readings continue with the two Books of Samuel for the First Reading during the first several weeks of the Season after Pentecost. Parallel passages for this episode in our Lord’s ministry can be found in Mark 3:31-35 and Luke 8:19-21. The verses in Mark 3 have been included in the three-year Lectionary. I wrote about Luke’s verses in 2013, and you can find an extensive explanation of the situation at the link above. They intended to take Him back to Nazareth. Yet, Luke 4:16-30 tells what happened earlier when Jesus preached in His hometown synagogue. The townspeople were resentful that Joseph the carpenter’s son claimed that He is the fulfilment of Scripture. You can read more at the beginning of this post. 29And they rose up and drove him out of the town and brought him to the brow of the hill on which their town was built, so that they could throw him down the cliff. 30But passing through their midst, he went away. 31 And he went down to Capernaum, a city of Galilee. And he was teaching them on the Sabbath, 32and they were astonished at his teaching, for his word possessed authority. Matthew 12:43-45 – Jesus, parable, unclean spirit, demons, Pharisees. Matthew Henry’s commentary has a number of excellent observations about Mary’s and her sons’ request to speak to Jesus. First, why were they not indoors listening to Jesus’s teaching? … they should have been standing within, desiring to hear him. They had the advantage of his daily converse in private, and therefore were less mindful to attend upon his public preaching. Note, Frequently those who are nearest to the means of knowledge and grace, are most negligent. Familiarity and easiness of access breed some degree of contempt. We are apt to neglect that this day, which we think we may have any day, for getting that it is only the present time we can be sure of tomorrow is none of ours. There is too much truth in that common proverb, “The nearer the church, the further from God ” it is pity it should be so. Secondly, why were they interrupting Him when He was teaching and preaching? They not only would not hear him themselves, but they interrupted others that heard him gladly … The mother of our Lord desired to speak with him[;] it seemed she had not then learned to command her Son, as the iniquity and idolatry of the church of Rome has since pretended to teach her: nor was she so free from fault and folly as they would make her. Thirdly, wouldn’t Mary have been reminded of Jesus’s teaching in the temple as a boy? … if she had remembered it now, she would not have given him this interruption when he was about his Father’s business. Note, There is many a good truth that we thought was well laid up when we heard it, which yet is out of the way when we have occasion to use it. This episode shows Mary in her humanity: loving but flawed. Each of the three Gospel passages recounts the story in nearly identical wording. He is trying to say, at this point, that earthly, physical relationships are not an issue with Him. “Who is my mother? Who are My brothers?” In other words, “Who is really related to Me? Who is really in My family? Who really has any intimacy with Me? Who can really put demands on Me regarding responsibility and fellowship?” In verse 49, He answers His own question. “And He stretched out His hand toward His disciples and said, ‘Here are My mother and My brothers! '” He’s saying, “Do you want to know who is related to Me? Here they are. They are related to Me; they are My spiritual family.” That’s the only real family that matters. He loved Mary and His brothers but He was, as in the temple in his youth, about His Father’s work. As such, He considered His disciples to be His family, too (verse 49). It is the will of the Father that you hear the Son. It is the will of the Father that you believe in the Son. It is the will of the Father that you be saved, and it is not the will of the Father that you perish. Doing the will of the Father in Heaven, then, is simply coming to salvation in Christ. The season of Advent is upon us as we await the celebration of our Saviour’s birth. Advent resources for Catholics and Protestants has a good list of websites by denomination. Included are short films and activities for children to better understand the season. Please be sure to check for ‘2012 updates’ for the most recent pages. It also discusses the Archangel Gabriel’s appearance to Mary, who conceived by the Holy Spirit, whilst her cousin Elizabeth was in her final trimester. Truly, it was a dramatic and intense time for all involved. Joseph, too, wondered whether he should quietly dissolve his relationship with Mary (Matthew 1:19). More personal upheaval is hard to imagine. They must have had questions from people. One cannot help but wonder what was asked and how, through the wisdom of the Holy Spirit, they responded. And poor Zechariah must have been busy writing on slates for nine months! The 2013 religious set of Christmas stamps from Britain’s Royal Mail were exceptional. The colours of Mary’s mantle and attire have changed through the centuries, depending on religious tradition and paint dyes. This series of stamps can help us to better interpret representations of the Madonna and Child in religious art. Most art museums in major cities around the world have paintings permanently on display of Mary and Jesus. It is likely that you and your families or friends have seen or will see them, therefore, it helps to know a bit about how to ‘read’ them. Earlier Church colours for Mary were blue and red or red and green. Blue depicts her holy nature approaching the divine — the colour of the sky or heaven — and red symbolises the earth, her humanity. Some Renaissance paintings and Eastern Orthodox depictions use green and red. Notice that the Infant Jesus wears gold or white or has a bright appearance; this is to indicate His divinity. Another aspect to consider is the cost of the dye when early Renaissance painting began. If you’ve studied Mediaeval religious art, you’ll notice that the dyes are less pronounced in colour. Partly this is because those paintings were frescoes, where colour was applied to moist plaster surfaces. However, certain colours were highly expensive. On a more practical note, the color blue used in medieval painting was derived from lapis lazuli, a stone imported from Afghanistan of greater value than gold. Beyond a painter’s retainer, patrons were expected to purchase any gold or lapis lazuli to be used in the painting. Hence, it was an expression of devotion and glorification to swath the Virgin in wide flowing gowns of blue (as well as a not-too-subtle expression of the patron’s wealth). However, it should be noted that Mary does not have an official color, and red has also been widely employed in her representation, particularly amongst German painters. Further, light blue is very popular, and is often (though perhaps as reflection, rather than motivation) associated with the color of the pure sky. In art, therefore, Mary had to stand out from the crowd, ordinary people that wore normal colours of brown, yellow or red, as she was seen as someone special by the church because she was the mother of Jesus himself. In the middle ages, paint pigments were obtained from either different coloured clays (like yellow and brown) or ground up minerals (like cinnabar for red or lead oxide for white). However, the only blue pigment possible in those days was a ground up precious stone called ultramarine, which can still be found in expensive jewellery today. Nowadays the pigment ultramarine is synthetically made and is cheap, but then it was extremely expensive. In fact it was several times more expensive than gold. Therefore it was THIS pigment that was reserved for Mary’s robe alone and nothing else in medieval religious art. Jesus was often depicted in gold leaf but Mary in blue ultramarine to show her importance. In the West, Catholic painters and sculptors have increasingly portrayed Mary in blue and white, sometimes adding gold, but omitting the red. the spots of the seven-spot ladybird (the most common in Europe) were said to symbolise her seven joys and seven sorrows. … Common names in other European languages have the same association, for example, the German name Marienkäfer translates to Marybeetle. The ladybird, unless threatened by parasitoid wasps, quietly goes about its business eating garden pests which can otherwise plague plants. In a day before pesticides — and even now — these unusual flying beetles have long been prized as a gardener’s friend. Now, back to Christmas stamps. In Antoniazzo Romano’s Virgin and Child with the young St John the Baptist (c.1460–80), in the Early Renaissance style, Mary holds Jesus on her left arm and points towards him with her right, indicating that he is the way to salvation. In Madonna and Child (c.1520), painted in the High Renaissance style, Francesco Granacci depicts the Virgin in her traditional garments of red and blue, earthly and divine, while the bird in Christ’s hand alludes to the coming Passion. Jacques-Louis David’s St Roch Praying to the Virgin for an End to the Plague (1780), which is painted in the Neoclassical style, is a deeply Catholic painting, depicting the Virgin Mary in her role as protector and intercessor. In La Vierge au Lys (1899), painted in the French Academic style by William-Adolphe Bouguereau, the Virgin and Child are enthroned, with Jesus held close by his mother, his outstretched arms suggestive of the crucifixion to come. In Theotokos, Mother of God [a new work specially commissioned for this collection] by Fadi Mikhail, which is painted in the Neo-Coptic style, Christ’s white tunic indicates his divinity, while the Virgin Mary’s blue mantle likens her to the sky, as in the icon of The Flight into Egypt. This is the one time of the year when nearly every Christian pauses to think about Mary and the miraculous circumstances of her becoming the greatest mother in history. Royal Mail’s selection of religious art helped to bring the Christmas story to life. The colours and the symbolism selected are common to paintings of their respective periods which add to our appreciation of them. Continuing a study of the passages from Luke’s Gospel which have been omitted from the three-year Lectionary for public worship, today’s post is part of my ongoing series Forbidden Bible Verses, also essential to understanding Scripture. Thus far, the two principal messages of Luke 8 have been the Parables of the Sower (parable, explanation) and the Lamp under a Jar. In both, Jesus teaches essential lessons about the Christian life. Listening and understanding the Word of God enables the believer to bear fruits of faith. We must not hide these grace-filled gifts from our neighbour. By contrast, those who do not bear these fruits are like the seed which was either eaten by birds or withering on stony ground. Those who go through the motions, declaring themselves to be believers when they are not, will find that their hearts are eventually revealed. They face divine condemnation. Today’s passage ties in with these two parables, as our Lord explains He came to preach to His family of believers. Again, we have evidence of a real and personal relationship between Jesus and those who believe on Him. In verse 19, we read that Mary and her sons — Jesus’s stepbrothers — came to see Him but there were too many people around Him. Back now to Luke’s Gospel. Before looking more closely at today’s passage, it is useful to recall why — even if He had wanted to — Jesus would not have returned to Nazareth. Now to today’s passage. Someone told Jesus that His family were waiting for him (verse 20). Jesus says that His family are those who hear God’s word and obey it (verse 21), which ties in with the aforementioned Parables of the Sower and the Lamp under the Jar. 3. Jesus Christ would rather be busy at his work than conversing with his friends. He would not leave his preaching, to speak with his mother and his brethren, for it was his meat and drink to be so employed. 4. Christ is pleased to own those as his nearest and dearest relations that hear the word of God and do it they are to him more than his mother and brethren. Believers are as true family to our Lord. Christ is not one of the distant, arbitrary deities encountered in other world religions. He alone wants a close relationship with us through prayer, Word and Sacrament. He died the most horrible and humiliating death — for our sins. He is a generous, loving, merciful Lord. He promises eternal life with Him, despite our sinfulness. What other world religion can say the same? Not one. … the picture is clear. The Lord says the people who have a relationship to Me hear the Word of God evangelistically. They hear it authentically. They hear it fruitfully. And they hear it obediently. It’s important to preach the Word, that’s my responsibility. It’s important to do that. It’s critically important to hear. You can do an inventory on your own heart, what kind of hearer are you? Be careful how you listen. Today’s post continues an examination of the passages from St Luke’s Gospel which have been excluded from the three-year Lectionary used in public worship. It becomes part of my ongoing series Forbidden Bible Verses, also essential to understanding Scripture. Luke 3 begins with a summary of John the Baptist’s ministry and ends with the genealogy of Jesus Christ. Some Christians say that it really isn’t necessary to get baptised in order to be saved. In certain circumstances, that is probably true. However, if a supposed believer has spent his entire life with churches nearby, not joining a church and seeking baptism is questionable. If Jesus actively sought baptism when He didn’t need to, who are we to actively reject this sacrament? Notice is here taken of Christ’s praying when he was baptized, which was not in Matthew: being baptized, and praying. He did not confess sin, as others did, for he had none to confess; but he prayed, as others did, for he would thus keep up communion with his Father. Note, The inward and spiritual grace of which sacraments are the outward and visible signs must be fetched in by prayer; and therefore prayer must always accompany them. We have reason to think that Christ now prayed for this manifestation of God’s favour to him which immediately followed; he prayed for the discovery of his Father’s favour to him, and the descent of the Spirit. What was promised to Christ, he must obtain by prayer: Ask of me and I will give thee, etc. Thus he would put an honour upon prayer, would tie us to it, and encourage us in it. There are plenty of older Christians around who no longer pray. Years ago, one told me, ‘I don’t pray anymore. I’ve said enough prayers in my lifetime.’ Yet, if Jesus Christ prayed, so should we, if we hope to imitate His example. Christ would be baptized last, among the common people, and in the rear of them; thus he humbled himself, and made himself of no reputation, as one of the least, nay, as less than the least. He saw what multitudes were hereby prepared to receive him, and then he appeared. After the Holy Spirit descended in bodily form and a voice from heaven declared Jesus ‘beloved’, Luke proceeds to give us His lineage. All of this is to prove that He was not self-appointed as some ‘theologians’ and atheists put forth. He is the beloved Son of God and He is descended from the House of David. Both are important to establish that Jesus did not emerge from nowhere. Whereas Matthew gives us Joseph’s family line, Luke gives us Mary’s family history. He is the only Gospel writer to mention the Annunciation (Luke 1:26-38) and the only one to include the Presentation at the Temple featuring Simeon’s and Anna’s prophecies (Luke 2:22-32). Therefore, Luke is carefully setting forth Jesus’s credentials and legitimacy for us via Mary. When Joseph entered into his … rulership of Egypt, according to Genesis 41 … it says that Joseph was 30 years of age. And when David ascended to the throne of Israel, according to 2 Samuel 5:4, it says he was 30 years of age and he ruled for 40 years. And according to Numbers chapter 4, when somebody entered into priestly service, they needed to be 30 years of age. So it was a…it was a common age in the mind of a Jew for a prophet, for a priest, for a ruler and for a king, namely the King David, isn’t that an interesting parallel? David himself was 30 when he entered in to his royal rulership. So Jesus waited until an age when I think there would be an acceptance of his maturity … certainly He would have been capable at the age of 18, or 19 or 20 to engage Himself in the way He did in His ministry, but He waited until an appropriate age which the people would acknowledge as an appropriate age, the age of 30. And He began His ministry. Verse 23 also contains the qualifying words of Joseph ‘as was supposed’, meaning, as far as everyone else was concerned he was Jesus’s father but we know that in reality he was His earthly, foster father. The more one reads these accounts of Jesus’s life, the more one realises how God arranged it through His people according to Jewish custom and family norms. Mary could have been a single mother, but she wasn’t. Mary and Joseph could have decided to skip the circumcision, but they did not. The Holy Family could have opted out of Jewish observance but they did not. Jesus could have kept teaching from the time He went missing in the Temple, but He did not. He did not need to be baptised, yet He was. Yet, here we are in the 21st century exempting ourselves from all manner of religious and family responsibilities. Now on to the rest of the genealogy of Christ Jesus. In verse 23, after the mention of Joseph, we read ‘the son of Heli’ — Eli. This Eli was Mary’s father, according to our commentators. Other Protestant Bible scholars will attest to that. her name and that of her husband Joachim come only from New Testament apocrypha, of which the Protoevangelium of James, written perhaps around 150, seems to be the earliest that mentions them. the genealogy in Luke is actually the family tree of Mary, and that Heli is her father. To resolve the problem of Joseph having two fathers – one descended from Solomon, one descended from Nathan, son of David, traditions from the 7th century specify that Heli was a first cousin of Joachim. the son of Adam, the son of God. From this we can better understand later theological references to Jesus as ‘the second Adam’. (1.) Some refer it to Adam; he was in a peculiar manner the son of God, being, more immediately than any of his offspring, the offspring of God by creation. (2.) Others refer it to Christ, and so make the last words of this genealogy to denote his divine and human nature. He was both the Son of Adam and the Son of God that he might be a proper Mediator between God and the sons of Adam, and might bring the sons of Adam to be, through him, the sons of God. Why would the writer if he’s going to give an accurate genealogy and he’s going to be consistent with his terms all the way down use tou, leave out “son” in every one except with Joseph use “the”…use “son” and leave out “the”? Why does he do that? Because he is separating Joseph from the genealogy. And if you want to organize the verse, let me suggest that this is how the verse should be read. And it gives you this latitude in the Greek language. The verse reads like this, “Jesus Himself, supposedly Joseph’s Son, was about 30 years old when He began His ministry being a Son of Heli.” That is the way you would read the verse. “Jesus Himself, supposedly Joseph’s Son,” just take that phrase because it’s a completely different structure than all the rest of the phrases in the genealogy. “Jesus Himself, supposedly Joseph’s Son, was about 30 years old when He began His ministry being a Son of Heli.” You just jump to the grandfather which was very often done in genealogies, particularly in Luke’s case where he wants to leave out the name of the women and keep the classic form. The actual genealogy then has to begin with the first male member and Luke has to decide how to do that under the leading of the Holy Spirit since there’s never been anything like this before. But he jumps to the first male member behind Jesus which was His grandfather, the father of Mary. That’s a very important note. So this is Mary’s genealogy. … none of those names, except Shealtiel and Zerubbabel, appear in Matthew’s genealogy. So that’s the only place the lines crossed. They’re two distinct lines. One back to Nathan, one back to Solomon. Once you hit David in verse 31, the names become the same in both genealogies from David all the way back to Abraham. Abraham is indicated in verse 34. So when you go from David to Abraham, it’s the same as Matthew’s genealogy. And, of course, Matthew’s genealogy stops at Abraham and so after Abraham you go back, Terah, Nahor, Serug, Reu, you go all the way back, verse 38, Enosh, Seth, Adam, God. And that’s basically the flow of the genealogy. From Neri to Nathan are names we don’t know anything about. In fact, from Heli back the only names we know or recognize are Zerubbabel and Shealtiel all the way back. But when we hit David, the names are very familiar because the names from David to Abraham are recorded in the Bible so we know those names. They’re very familiar Old Testament names. And when we get back to Abraham, from Abraham to Adam are names in the genealogies of Genesis. So those two are familiar names. This is the point of Luke’s history in these verses. Jesus’s family history can be traced all the way back to the beginning from Mary’s side. Matthew documents Joseph’s side showing the same legitimacy. Jesus is not an unknown from nowhere. All the more reason to beware of cult leaders and madmen — unknowns — who claim to be Christ or His messenger (e.g. Charles Manson, Jim Jones — past examples). It hadn’t occurred to me to write about this feast day until this week. French radio this week has been loaded with adverts for crêpes, Nutella, cidre (mildly alcoholic cider) and rum (this particular brand from Bardinet distillers). What’s the occasion? As a youngster, I always confused it with St Blaise Day, which is February 3. Any of us who has done that can be forgiven, as church candles are blessed on Candlemas and priests bless throats of the faithful with two beeswax candles arranged in an X the day after. On the nearest weekend, these feasts are sometimes combined at Mass. This feast is commemorated by Catholic and some Lutheran, Anglican and Orthodox (celebrated two weeks later) churches. February 2 recalls two events: a) Jesus’s formal Presentation in the Temple and b) Mary’s return to the Temple after childbirth, which carried over into Christianity as a ceremony called the Churching of Women, more about which in another post. Candlemas is always on February 2 because it is 40 days after Christmas and the date when Jewish ceremonies for mother and male child are performed. 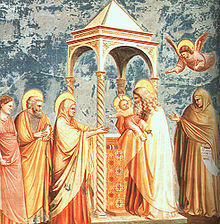 According to Jewish law (Leviticus 12, Exodus 13:12-15), Mary would have had to complete her ritual purification prior to accompanying Joseph and Jesus to the Temple. The presence of the infant Jesus, although circumcised and formally named (January 1), was required so that the priests could conduct the ceremony of the redemption of the firstborn. In those days, Mary and Joseph would also have brought an animal sacrifice. Better-off families would have brought a lamb. The Holy Family brought two doves, the option for poorer couples. Lord, now lettest Thou Thy servant depart in peace; according to Thy word: for mine eyes have seen Thy salvation, which Thou hast prepared before the face of all people: to be a light to lighten the gentiles and to be the glory of Thy people Israel. Luke tells us that the Holy Spirit told Simeon that he would not die until he had seen Jesus. Anna the Prophetess, a wise and pious widow, was also present in the Temple. The Eastern Orthodox Church remembers both Anna and Simeon on February 3 or 16, depending on the calendar used, because, as Luke’s Gospel says, Jesus met Israel, as personified by these two faithful servants of God. Nearly two centuries later, in 541, a plague was devastating Constantinople. Emperor Justinian I ordered that the Christian faithful pray on this day for the deliverance from evil and an end to the plague. The following year, by way of thanksgiving, the Emperor declared this feast a solemn one to be observed throughout the Byzantine — Eastern — Empire. Late in the 4th century, this feast’s date was moved to the current day of February 2. This was because Rome had declared that Christmas would henceforth be celebrated on December 25. However, it some time passed before the Presentation of Jesus at the Temple took root in Western Europe. These days, Candlemas is the date by which Christmas clingers-on must take down their decorations. Nonetheless, the feast brings imagery of candles, flames and ashes. These traditions will be covered below. In an ecclesiastical context, however, the Benedictional of St Aethelwold — Bishop of Winchester — includes a blessing for candles to be used at church services. Today, the priest still blesses a year’s worth of candles. Western unbelievers will argue that the Church somehow stole this date from European agrarian and pagan traditions. Quite possibly. However, ‘stole’ might not be quite the correct term. It seems that the Early and Mediaeval Church might have wished to move feasts to days which were already ‘marked’ in the calendar by much of the population of Europe. This could be because of the ancient Roman feast of Lupercalia. However, opinion is divided. Whatever the case, an atavistic significance seems to have been attached to this particular day across the Continent and the British Isles. February 2 was the day when farmers removed cattle from the hay meadows which were to be ploughed for springtime planting. In Scotland, it was — and still is — a quarter day for paying off debt and submitting rent which is due. In Armenia, farmers scattered ash over their fields for a better crop yield; people even kept ashes on their roofs to ward off evil spirits. Young married women were encouraged to purify themselves by jumping over bonfires in order to ensure a sound pregnancy. Young men needed to do the same. Sailors feared setting sail on this day for fear their vessel might sink. Among the ancient Celts, February 2 was the pagan feast of Imbolc, involving their totemic Brigid. Many of her attributes have since been ascribed to the sainted abbess, Brigid of Kildare. The serpent will come from the hollow on the brown day of Bridget / Though there should be three feet of snow on the flat surface of the ground. Today’s pagans continue to celebrate this date because it is the astronomical midpoint between winter and the spring thaw. So, it would seem that God granted everyone — believers and unbelievers — some knowledge of what to remember or to look out for on February 2. Is it Jesus or Mary who is celebrated? Protestants commemorating this feast put more weight on it being the feast of our Lord’s first presentation at the Temple. Various European countries have other traditions and superstitions relating to February 2. I mentioned the French and their crêpe parties. Apparently, these sweet delights should be eaten only after 8 p.m. Anyone flipping them in the pan whilst holding a gold coin in the other assures their family of good luck that year. Oh my! Yet, it was at this time that early Christian pilgrims received crêpes on their pilgrimages to Rome. Extra flour from the previous season which would have gone off was used to make them. In that way, no flour went to waste. On Candlemas, winter ends or strengthens. In Italy, La Candelora signals the last cold day of winter. In the Canary Islands, residents remember Mary, the Virgin of Candelaria — their patron saint. In parts of Latin America, whoever ‘won’ the coin or token from the Epiphany cake must pay for a meal featuring tamales. For those countries or regions with festivals leading up to Mardi Gras — Fat Tuesday, the day before Ash Wednesday — their parade season starts around now. I realise that people will think it sinful for such syncretic (a mix of the diametrically opposed) information to appear on a Christian blog. However, like it or not, we are a world of nations made up of various influences dating from our earliest days. I can appreciate if you think this is wrong, and I can understand your reasoning. I’m not asking you to condone the syncretic; this is merely an explanation of why some Christians do the things they do in the run up to Lent. My very best wishes to all my readers for a very happy 2013! Historically, the Church commemorated Jesus’s circumcision on this day. Since the Renaissance (specifically, the papacy of Pius V), the Catholic Church has designated this day as the Solemnity of Mary the Mother of God. It was usual for, if not mandated that, Christians attend church on New Year’s Day as a refusal to descend into the pagan revelry associated with the New Year. Penance and fasting were also part of the commemoration of this day in the early Church.